Consider, in particular, long-lived investments such as infrastructure. Project developers need to make decisions today on how to design a hydro-power plant, an irrigation scheme, a road. How much electricity generation capacity should they put in place? How many hectares should they equip for irrigation? How thick should the road asphalt be? These decisions matter, because they determine that project's ability to deliver the intended benefits under the climate of the future. The wrong decision can lock projects in design solutions unsuited to changing conditions. Scarce investment capital could be wasted, and development opportunities could be missed. These issues are of special relevance for Africa. 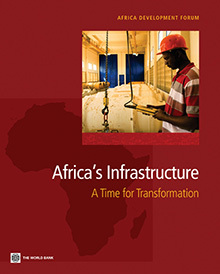 In 2010, the Africa Infrastructure Country Diagnostic—which resulted in the first volume published in the Africa Development Forum (ADF) Series (“Africa’s Infrastructure: A Time for Transformation”)—found that to enable Africa to fill its infrastructure gap, US$93 billion per year will need to be invested for at least a decade. The Program for Infrastructure Development in Africa (PIDA), endorsed in 2012 by the continent’s heads of state and governments, lays out an ambitious long-term plan for closing Africa’s infrastructure gap, including major increases in hydroelectric power generation and water storage capacity. How will climate change affect Africa's plans to upgrade its infrastructure? 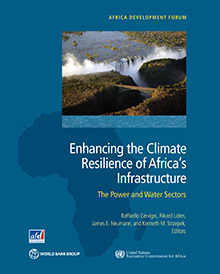 ​Our recently published book, Enhancing the Climate Resilience of Africa's Infrastructure: The Power and Water Sectors, sheds light on this question. This book evaluates—using for the first time a single consistent methodology and a wide range of state-of-the-art scenarios—the impacts of climate change on hydropower and irrigation expansion plans in Africa’s main river basins (Congo, Niger, Nile, Orange, Senegal, Volta, and Zambezi), as well as the effects on the electricity sector across four power pools (West, Eastern, Central, and Southern). The book demonstrates that failure to integrate climate change in planning and designing power and water infrastructure could entail, in the driest scenarios, significant losses in hydropower revenues and increases in consumer expenditures for energy. In the wettest climate scenarios, business-as-usual infrastructure development could lead to substantial foregone revenues if the larger volume of precipitation is not used to expand the production of hydropower. We estimated that the dry scenario loss of hydropower revenue would range between 5-60 percent of the no-climate-change baseline (depending on the basin), with increases in consumer expenditures for energy up to three times the corresponding baseline values as a result of dwindling hydropower production. The potential foregone revenue in the wettest climate scenario is an estimated 15-130 percent of the baseline. In irrigation, the largest projected revenue loss is 10-20 percent for most basins. In wet scenarios, the largest foregone gains are estimated to be 1-4 percent; the exception is the Volta basin, where they are projected to be one order of magnitude higher. Does this mean that Africa should slow down investments in infrastructure because of climate change? Quite the contrary―a stronger infrastructure base will make African countries more climate resilient. But long-lived projects need to factor in climate change, from the early stages of planning to the later stages of feasibility assessment and design. In the case of hydropower, we found that integrating climate change in investment planning can cut in half (or more) the worst-case climate change impact (loss of revenue or missed opportunity to increase it) that would be faced if project developers ignore climate change. The analysis further suggests that the benefits in terms of reduced risks significantly exceed the costs of modifying baseline investment plans in all basins analyzed. The only exception is the Congo basin, where climate projections point to limited expected changes in the current hydrological regime, making the economic case for modifying existing plans less compelling. So what does it take to build Africa's infrastructure in a climate-resilient manner? We argue that the basic tools are becoming increasingly available, but that further confidence needs to be built in the community of practice on the use of these tools. Much more needs to be done to bring together project developers, climate scientists, and financing organizations to tackle the challenge together. The World Bank is working with the African Union Commission and the United Nations Economic Commission for Africa (UNECA) to find a solution. In Paris, we will present the idea of an Africa Climate-Resilient Investment Facility to get the job done. Stay tuned.